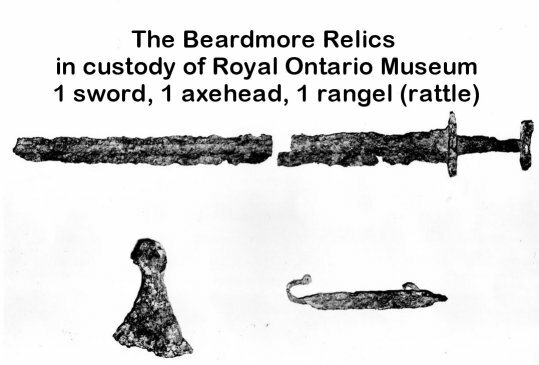 "The Beardmore Relics are a cache of Viking Age artifacts, said to have been unearthed near Beardmore, Ontario, Canada, in the 1930s. The cache consists of a Viking Age sword, an axe head, and a bar of undetermined use (possibly a part of a shield). It has been claimed by some that the relics are proof of the early Norse occupation in northern Ontario. While the authenticity of the fragments is not generally disputed, the "discovery" is generally considered to be a hoax. In the 1930s, the Royal Ontario Museum (ROM) purchased the relics from the man who supposedly unearthed them. For about twenty years they were prominently displayed by the museum; however, the museum was forced to pull the relics from display following a public enquiry in about 1956–1957. About this time, the son of the supposed discoverer admitted that his father had planted the relics."